Fireflies. " 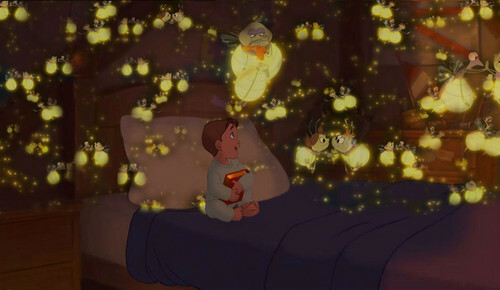 'Cause I'd get a thousand hugs, from ten thousand lightning bugs, as they tried to teach me how to dance, a foxtrot above my head, a bít tất, sock hop beneath my bed..." -Owl City, Fireflies. HD Wallpaper and background images in the Chuyển thể của hãng Disney club tagged: disney crossovers treasure planet the princess and the frog owl city fireflies. This Chuyển thể của hãng Disney photo contains bó hoa, phần trên áo đàn bà, bó hoa thơm, bouquet, corsage, posy, and nosegay.